Draft Barn Einstok Tap Attack - Oak Beverages Inc. 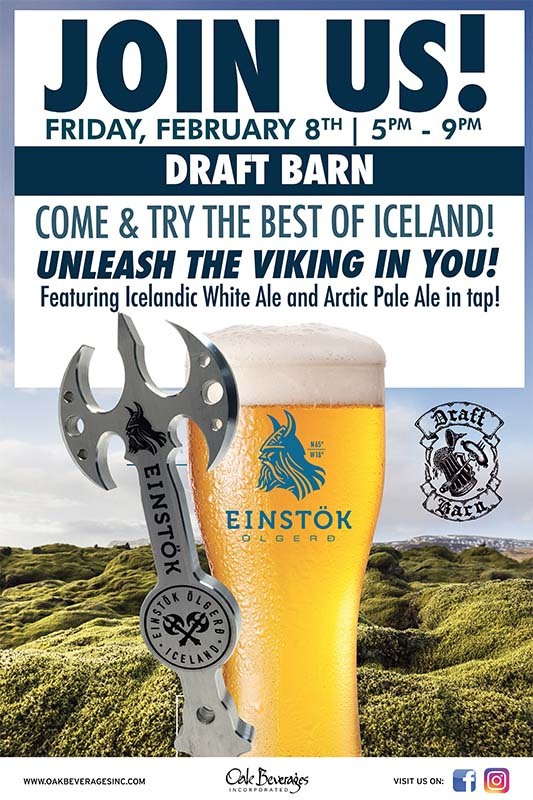 Draft Barn Einstok Tap Attack, Friday, February 8th, 5pm – 9pm. Come and try the best of Iceland! Unleash the Viking in you! Featuring Icelandic White Ale and Arctic Pale Ale on tap! The Einstök Brewery is located just 60 miles south of the Arctic circle in the fishing port of Akureyri, Iceland. There, the water flows from rain and prehistoric glaciers down the Hlíðarfjall Mountain and through ancient lava fields, delivering the purest water on Earth, and the perfect foundation for brewing deliciously refreshing craft ales. American and Bavarian craft come together with the finest Icelandic water to create the Viking version of the Pale Ale. Our quest was to make the best white ale we ever tasted, with the complex flavors of a classic witbier, all brewed with pure Icelandic water for a cool smoothness that is deliciously refreshing. Draft Barn Avenue X Brooklyn is one of New York City’s best Hidden Secrets, right in the heart of Brooklyn! With over 250 beers from across the world, Draft Barn’s increasing popularity is not only due to its wide assortment of beer but also it’s delicious food. Way out near the edge of Gravesend Bay, in the shadow of NYC’s largest subway yard, The Barn boasts Brooklyn’s most expansive imported beer selection. The moest lineup of 11 taps is dwarfed by more than 300 bottles from at least 100 different breweries. Fully half are German or Belgian, but hard-to-find farmhouse and English ales are also represented, as well as a smattering from the Yanks. If you find yourself on Coney Island for the day, make sure you leave the car keys at home and stop in for several hours. The dozen German-style sausages available will help you put down a base. Posted in Featured Promo, Tap Attack, Tap Takeover.